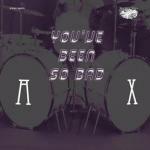 Ax - "You've been Bad"
Ax was a Canadian band from 1970 that featured 4 long haired dudes. They never released anything and these 3 tracks are all that has been salvaged of this 70's hard rock band. It is quite cool that Rise Above released this on a limited edition 10" in black and purple vinyl in a nice gatefold sleeve with lots of pictures of the band and insert with a cool story as well. As for the music, the title track is a really cool rock track. The production is really low fi but it really captures the raw essence of the band and is a cool track with some great guitar jamming on it. It Can Make You Happy is more of a straight up melodic rock and roll track with some nice bass playing and a complicated bridge section. The singer had a pretty cool distinctive rock voice that fit well. Not as hard edged as the first track but pretty cool as well. The B-side is the only other surviving song in any quality that anyone would want to hear and that is called Babies Falling From The Sky. This is a slower heavy blues rock track that speeds up at the end a bit and rocks! Crank it up and go back to 1970!